Somewhere between the fancier notebooks at your local big box store and high-powered desktop replacements is the “budget” gaming laptop, a modestly-priced portable system built to play games well enough. Origin PC’s latest Eon15-S is the perfect example. The Eon15-S is a 15-inch laptop designed by system builder Origin PC to deliver the boutique custom PC experience at a low cost of entry. It’s got a 15.6 inch 1080p IPS LED screen and a Nvidia Geforce GTX 1050 Ti graphics card. The most basic configuration, priced at $999, comes with 8GB of DDR4 memory and an Intel Core i3-7100H dual-core processor running at 3.00GHz. Our system was slightly beefier than that, with a Core i5 and a total of 16GB of DDR4. Extra storage options brought the grand total up today $1,350. 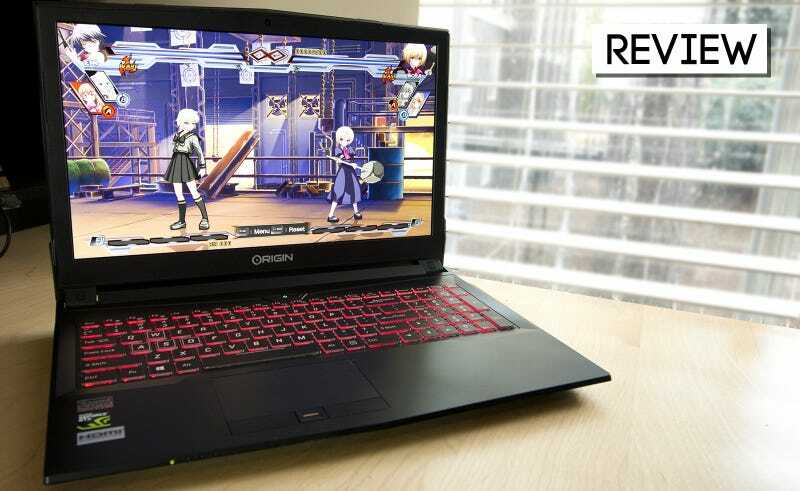 The Eon15-S is a laptop created to play modern games between 30 and 60 frames per second at 1920 x 1080 resolution, and it does that. Rise of the Tomb Raider averaged about 53 frames-per-second on high settings. Battlefield 1 on ultra was right around the 50 mark. Tweaking settings can speed things up, if you’re willing to sacrifice visual quality. And if you’re not, this might not be your laptop. It’s A Good Look: I like what Origin does with the design of their laptops. Beauty is in the eye of the beholder, of course, but I like the subdued lines, and modest logo combo going on up top, and you can’t go wrong with the starship exhaust look going on in back. Those looking for something other than basic black are in luck as well, as Origin offers a wide array of custom paint options, from metallic pink (which they wouldn’t have gotten back had they sent it) to flames and special finishes. All The Ports: The Eon15-S has the usual array of USB 3.0 and 2.0 ports (two and one respectively). It’s got a USB C port, which will come in handy eventually, a network port and even my favorite—a memory card reader. But where the system goes above and beyond is the video outputs. Not only do we get the standard HDMI out, we’ve also got a pair of mini DisplayPorts, one of which supports Nvidia’s GSync tech. It’s like they want you to hook up a couple of external monitors or something. The Keyboard, Mostly: Now, I am a big fan of mechanical keyboards, and this is not a mechanical keyboard. As flat membrane keyboards go, however, this one is pretty nice. It’s got a soft feel that’s never mushy. It’s got RGB backlighting. Plus they’ve even managed to fit a number pad on there, for folks who can’t live without those extra digits. Removable Battery: It feels like forever since I’ve seen a laptop with a removable battery. That’s probably because most laptops I review are trying to cram as much power into a tiny space as possible, which results in tucking the battery away into impractical spaces. Of course a removable battery begs an extra battery, and with about three and a half to four hours of life during non-gaming moments (typing, watching videos) you’ll probably want to pick one up. The Sound: I’ve played with some really amazing-sounding laptops lately, so the whole “laptop sound is always going to be poor” thing isn’t going to fly. Muffled and tinny, the Eon15-S is nowhere near as pleasant on the ears as it is on the eyes. Pop in a nice pair of headphones and the Sound Blaster Cinema sound kicks in, but ick. The Build: Yeah, I know complimenting the look of the laptop and dissing the build is a strange combo, but in this case it fits. The lid and its lines look pleasant, but the panel itself is thin with a whole lot of flex to it. The speaker grills, located on the bottom front of the unit, sink in slightly if I grab the unit there. I’ve used several Origin laptops in the past and know this one can probably take a beating, but it doesn’t feel like it can. It’s much easier to judge a gaming laptop when it’s one of those balls-to-the-wall, over-the-top, no-expenses-spared deals. Laptops aimed at the upper tier customer have a ceiling they can hit in terms of performance, and anything beyond that is flash and dazzle. The Eon15-S exists in the shadowy beginning of “budget” gaming laptops, a space that exists somewhere between “plays everything just as I want” and “the best system they had at Target.” It fits there quite well, but there are a lot of other gaming laptops sharing the same space. What sets Origin PC’s Eon 15-S apart? It’s got a excellent display, a versatile selection of ports, a full-size (if a bit scrunched) keyboard and a removable battery. It looks nice. It comes with a lifetime support and labor warranty. And it can be painted pink.